Last month, the Chinese government announced  that it will launch a RMB 30 billion (USD 4.7 billion) theme park project in Tibet to attract tourists. The park will first be used as a shooting location for the movie Princess Wencheng, a story about the niece of a Tang-dynasty emperor who married a Tibetan king. 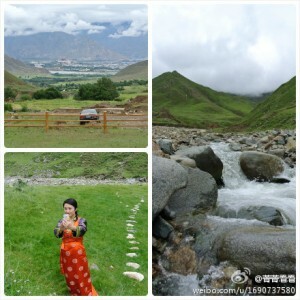 It is located on the outskirts of the city of Lhasa and will occupy 800 hectares of land. Tibetan dissidents have described the project as the “Disneyfication of Tibet ” rather than a genuine sharing and preservation of Tibetan culture. Cijiaolin village is just 2 kilometres away from Lhasa city. According to the legend, this is where the Princess Wencheng and her servant settled down. This is a marvelous spot for Tibetans to take time out. It is surrounded by mountains and rivers, with a large piece of grassland. You can see the Potala Palace  [formerly the chief residence of the Dalai Lama] from there. Within three years, such scenery will be replaced by a so-called cultural park, the Princess Wencheng theme park, with a 4 star hotel. Of course there will be some advantage in developing tourism, but I really hope everything remains the same here. 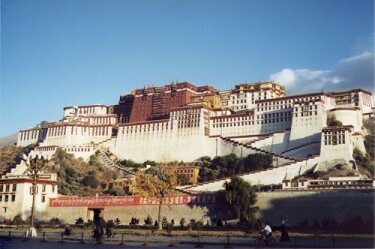 @0147739241 : I want to express my support for Lhasa. This must be a good project. The government as a facilitator cannot invest all the money, this is a call for investment. It not only helps the development of local tourism, but also a lot of construction projects such as roads and bridges. This is good for the people. Lhasa will be promoted to be an international tourism site. @bayniwffg : It is good to provide heritage. Just not sure if the fund really will go to the right spot or will be wasted. We still have many kids who are starving and who can't afford education. @xsccld187 : We should not build the theme park. Lhasa has rich natural resources, ethnic character and culture. No need to use theme parks and artificial constructions to attract tourists. If the project fails, it will ruin people's positive image of Lhasa and the number of tourists will drop. Eventually this will be a waste. @410753237 : when we need money for the right cause, you cry and say you are so poor. For a messy project like this, you have all the money. @ratpetty : The reason for us to travel to Tibet is to get closer to heaven and the spiritual world, to experience the purity of belief surrounded by mountains and rivers. We want to see the real living Tibet not the artificial and vulgar construction under the euphemism of culture and art. RMB 30 billion? Spend it on the people and improve their livelihood.